Petersburg’s Carnival Days is underway! Petersburg’s annual Carnival Days celebration is underway this week, June 23-25, featuring the D. C. Lynch Carnival and many activities for young and old alike. Tuesday events: Junior High Mud Volleyball, 4 p.m.; Flag Raising, 7 p.m.; Center Stage Dancers perform at 7:15 p.m., followed by Kids Races. Wednesday events: High School Mud Volleyball, 4 p.m.; Flag Raising, 7 p.m.; Youth Obstacle Course at football field, 7:15 p.m.
Thursday events: Dodge Ball at tennis courts, 4 p.m.; Free Barbecue, 6 p.m.; Flag Raising, 7 p.m.; ‘Are You Smarter than a BC Middle School Student?’ will follow at 7:15 p.m. Buses will run from Albion to Petersburg and back, for youth who would like to participate in the events. 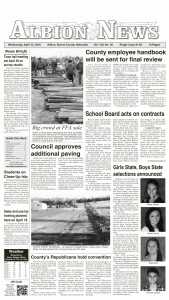 Details in this week’s Petersburg Press.